UPDATED January 15th at 4:00 pm with reaction to the Senate budget proposal and further information on funding for CPS. “The House’s budget proposal is a great start, although there are key priorities for kids that are missing from this first draft and the Senate’s budget proposal. As the Legislature builds on this proposal over the next few months, Texans will need to make sure legislators make additional strategic investments to reach some important goals, such as keeping open Early Childhood Intervention programs for toddlers with disabilities. “We’re excited to see the proposed $7 billion increase in education funding. The proposed increase in the Senate budget is significantly smaller. We appreciate that state leaders have made school finance a top priority for this session. As legislators work on a school finance plan to distribute that funding, they need to follow the School Finance Commission’s recommendation to invest in full-day, high-quality pre-k so kids are ready for kindergarten on day one and strong readers by third grade. The state currently only funds a half-day of pre-k for students who meet the eligibility criteria, although some districts pull funds from other areas to provide a full-day program. As our recent report demonstrated, districts are hurting from the pre-k cuts the Legislature made last session and are eager to offer full-day programs as long as the state provides adequate funding. “We’re glad to see the proposed budget includes the $54 million that TEA requested for a new initiative to boost support for student mental health and address other school safety issues. We are disappointed that the Senate budget currently excludes funding for this effort. To ensure we make real progress for students across more than 1,000 school districts, legislators will need to further increase funding. Given the high level of interest in boosting school safety, preventing youth suicides, addressing student trauma after Hurricane Harvey, and supporting student mental health to improve both academics and behavior, we’re optimistic that the Legislature will build on this initial proposal. We’re also pleased to see the House and Senate budget includes a $12 million increase for Children’s Community Mental Health and the funding TEA requested for compensatory services for students in special education, including students receiving services due to Emotional Disturbance. “We’re concerned that the House and Senate budget drafts excludes the $71 million needed to keep Early Childhood Intervention programs up and running for babies and toddlers with Down syndrome, autism, speech delays, and other disabilities and development delays. HHSC has made clear to the Legislature that an additional $71 million is needed after 18 ECI programs closed down amid inadequate state funding over the last eight years, yet the budget only includes a small $4 million increase for ECI. As we documented in our recent report, state funding for ECI has already fallen from $484 per child in 2012 to $412 in 2018. “The Legislature also has much more work to do adequately fund Child Protective Services, keep more children safely with their families rather entering foster care, and ensure that when children do enter foster care they are safe, recovering from trauma, and thriving. The Legislature must build on the progress it made on Child Protective Services challenges over the last two years. While the Legislature’s previous investments reduced caseloads for caseworkers assigned to abuse and neglect investigations, the state still has dangerously high caseloads for those caseworkers assigned to support youth in foster care. For this session, DFPS previously requested $324 million in “exceptional items” to cover CPS priorities, not including efforts to reduce caseloads or implement the new federal Family First Prevention Services Act. We continue to analyze the new budget proposals, but thus far we have not identified any funding in the first draft of the budget for the CPS exceptional items. There is an increase of $141 million in the base budget for CPS in the House budget, which is largely focused on maintaining current services to a growing state. “A number of other funding priorities are critical to children, including those involved with CPS. To improve maternal health and to keep more children safely with their families instead of entering foster care, it will be important to make smart investments in substance use treatment and recovery. Similarly, Legislators should invest in Prevention and Early Intervention services to prevent abuse and neglect, strengthen families, and place children on a healthy path in life. 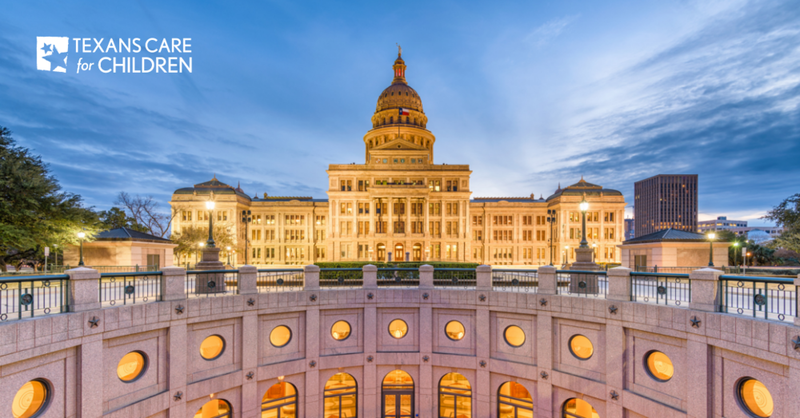 Additionally, to ensure appropriate medical care for children in foster care, low-income children, low-income pregnant women, and Texans with disabilities, we call on the Legislature to fully fund Medicaid.